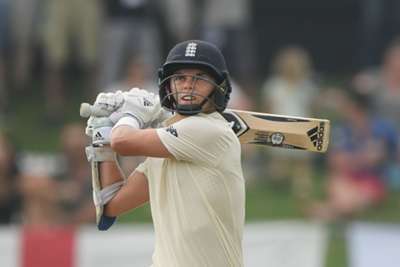 Sam Curran rescued England on the opening day of the second Test against Sri Lanka with a brilliant fifty on a difficult pitch in Kandy. On a dry track offering plenty of turn from the outset, England appeared set for a mediocre total until Curran cut loose with six maximums helping him score 64 and lift his team to 285 all out. The 20-year-old's excellent, attacking knock frustrated Sri Lanka as he motored from 16 to 51 in the space of 27 deliveries, building a 60-run partnership with James Anderson (7 not out) for the final wicket. Sri Lanka missed two opportunities to catch Curran – Malinda Pushpakumara inexplicably dropped him on the long-on boundary and Angelo Mathews saw the ball bounce just before going into his hands – before Dilruwan Perera (4-61) finally had his man to bring the innings to a close. Jack Leach (1-7) ensured the hosts did not get to stumps without loss, bowling Kaushal Silva on six as Suranga Lakmal's team closed on 26-1. Jack Leach took the wicket of Kaushal Silva late in the final session as the hosts finish the day on 26/1 in response to England's 285. Keaton Jennings scored a second-innings century in the first Test but was unable to continue that form as he nicked Lakmal (1-44) to Niroshan Dickwella for just one. England lost Ben Stokes (19) and skipper Joe Root (14) before Rory Burns fell short of a maiden Test fifty in just his second appearance by edging Akila Dananjaya (2-80) to Dhananjaya de Silva on 43, with the tourists left in trouble on 89-4. Jos Buttler (63) looked in fine fettle as he helped get England back on track with a half-century that included seven boundaries, but Ben Foakes (19) bizarrely did not suggest a review and simply walked off despite not appearing to have connected with the bat when he was caught off Dilruwan at slip. After Buttler swatted a poor reverse sweep off Pushpakumara (3-89) and Moeen Ali (10) and Leach (7) fell, Curran provided plenty of sting in the tail. He smashed two sixes off one Dananjaya over and plundered another off Perera in the next set of six. Curran cleared the ropes before being put down by Pushpakumara, to which he responded by sending a sweet maximum back down the ground. Mathews narrowly missed out on catching Curran after rushing in from long on, though Dimuth Karunaratne did not err when the Surrey youngster went for another six two balls later. Sri Lanka were unable to head into day two with their opening duo after Leach bowled Kaushal around the wicket in stunning fashion, meaning Karunaratne (19no) and Pushpakumara (1) will begin day two 259 runs behind.